Mordian 7th Regiment: Heresy Era Sons of Horus - Veteran squads and characters built! 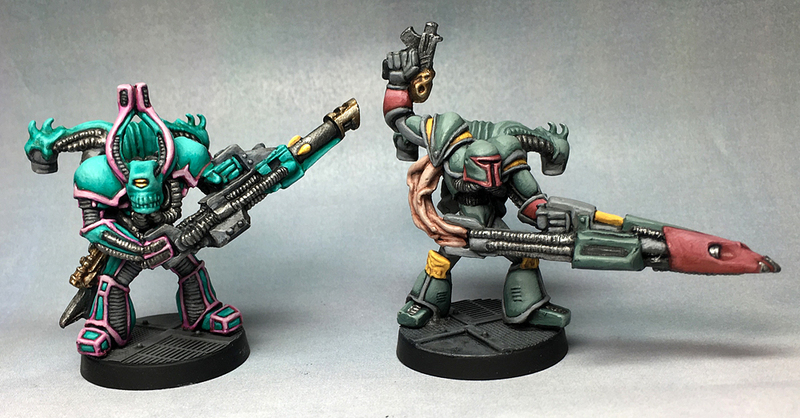 Heresy Era Sons of Horus - Veteran squads and characters built! So I'm planning on bouncing back and forth between the Dreadtober painting and continuing on with the Sons of Horus, as I'm just so jazzed to be working on 'em! Over the weekend I couldn't help but do a little building and put together a couple infantry squads to balance out the recent vehicles. One of the characters for the Sons of Horus is Maloghurst the Twisted, (deep breath) Cadre-captain of the Sons of Horus, Bearer of the Eye, The Shadowed Hand, and Equerry of the Warmaster. An interesting character, he's both a Praetor-class character allowing the use of Rites of War and also a standard bearer, carrying the Legion Standard - making any astartes units within 6" Fearless. 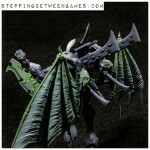 He also makes Veteran squads and Reaver Attack squads Troops choices. On the other hand, any unit he joins cannot Run or make Sweeping Advance moves, and only wears power armour rather than the usual Artificer plate. He does get a Refractor Field though which helps! The model is a mix of parts, based mostly on the Narik Dreygur model, as the face closes matches the one in the book, and the somewhat awkward pose makes him look a bit ungainly as he's described as well. While I was about it I dug out a Master of Signals model, which is a prerequisite for using The Black Reaving rite of war - not one that I expect to use that often but it's nice to have options! Pretty straightforward build with the addition of a SoH shoulder pad, and a radar dish swap for a little extra visual interest. There are several options presenting themselves making Veteran squads Troops choices, so I figured I may aw well go that route to begin with, and put together a pair of 'em. Used the leftover bits from making Maloghurst to bash together the two veteran sergeants, and mostly because I love the look went with a pair of the under-slung missile launchers as the squad's specialist weaponry. Definitely a callback to the old, old chaos renegade models. In order to give 'em a little extra brutalist flair some of the models were modeled wielding their chainswords and one-handing their bolters, opening up the poses to see the rather cool SoH torsos. I'm scheming on building out a few extra standard troopers and a couple Nuncio-vox operators to allow the units to run as basic tactical squads (dropping the missile launchers), and the leftover missile launcher from the set will also be built as a sergeant variant to allow them to be run as a Heavy Support squad. Mal there is the stuff of awesome. Just such a cool pose and banner and everything. You're still a bloody heretic, but that was a nice kit bash. Nice conversion for the Twisted, he was always a great character so it is nice to see you take him on. Liking the throw back reference on the veteran squads. Wow I love those missile launchers! If I ever get back round to doing another heresy army I'm definitely stealing that idea! @Rory Priest: Thanks very much! Rather enjoyed building 'em! @Nick Thrower: Cheers! I knew as soon as I saw the underslung versions I had to include them in an army! Of course they do, just like everyone knows my fav legion - The First, is totally loyal too! That Maloghurst is an awesome conversion. 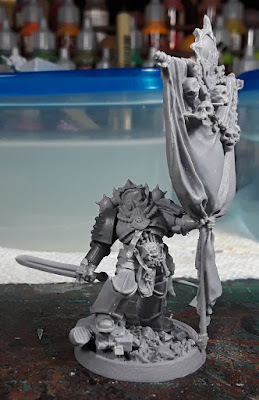 Nice looking conversion,cant wait to seet hem painted. Goodness, some amazing kitbashes and poses in this lot. @Joe B: Thanks very much! @Zzzzzz: Aye, they're on hold for the short term while I await the jump packs for 'em! @Fai: THanks man, I love those underslung missile launcher.